Dimensions 0.25 by 9.25 by 7.50 in. French language; Vocabulary; Juvenile literature. Poisson Un, Poisson Deux, Poisson Rouge, Poisson Bleu / One Fish, Two Fish, Red Fish, Blue Fish | Bonsoir Lune / Goodnight Moon | My First French Book | The Giraffe That Ate the Moon | Cat in the Hat English and French | Je T'aimerai Toujours / Love You Forever | French-English Picture Dictionary | Am I Small? Je Suis Petite, Moi ? Simple songs and rhymes are an excellent way to familiarize young children with another language. 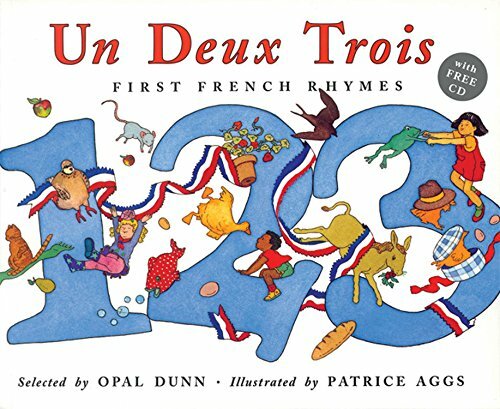 Un Deux Trois a collection of 25 traditional nursery rhymes, is a delightful way to introduce French. An illustrated vocabulary features simple words and phrases that are easy to learn and that can be used in games or everyday life. Children are encouraged to repeat the phrases and sing along with the rhymes, and the included CD lets them know how both should sound. The lively illustrations and amusing rhymes make learning a new language fun. A guide for parents translates more difficult phrases. Pap/com edition from Frances Lincoln Childrens Books (November 28, 2006); titled "Un, Deux, Trois: First French Rhymes"
About: Simple songs and rhymes are an excellent way to familiarize young children with another language. About: This book/cassette pack encourages children to imitate sounds they hear in order to develop a good French accent, and absorb the fluency of the language.